Your browser does not support inline frames or is currently configured not to display inline frames. The University of Hertfordshire’s groundbreaking work on KASPAR, a child-like robot it developed to help children with autism, has been chosen as one of the most important research projects taking place in UK universities. It has been chosen in new report, Big Ideas for the Future, jointly published by Research Councils UK (RCUK) and Universities UK, and which pulls together the leading research projects currently taking place across UK universities. Research from all fields, including science, social sciences, engineering, the arts and the humanities, were eligible to be included and the University of Hertfordshire’s project was selected for inclusion from hundreds of submissions. The report is narrated and backed by high-profile celebrities such as Professor Lord Robert Winston, Dr Alice Roberts and Professor Iain Stewart. 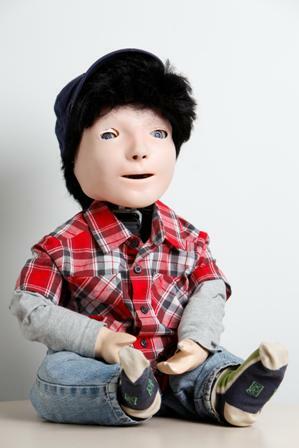 The Hertfordshire team led by Professor Kerstin Dautenhahn at the University of Hertfordshire are using interactive humanoid robots as therapeutic ‘toys’ to help children with autism. They developed KASPAR (kinesics and synchronisation in personal assistant robotics), a child-like robot.